In February of this year, I visited the sprawling campus of Viriginia Theological Seminary, in Alexandria, VA, close to Washington DC, USA. Margaret Adams Parker, artist and adjunct instructor at the seminary, very graciously gave me a tour. In between our viewing of the newly constructed chapel and the ruins of the old chapel, which was consumed by a fire on October 22, 2010, I had the pleasure to linger at her sculpture Mary as Prophet. 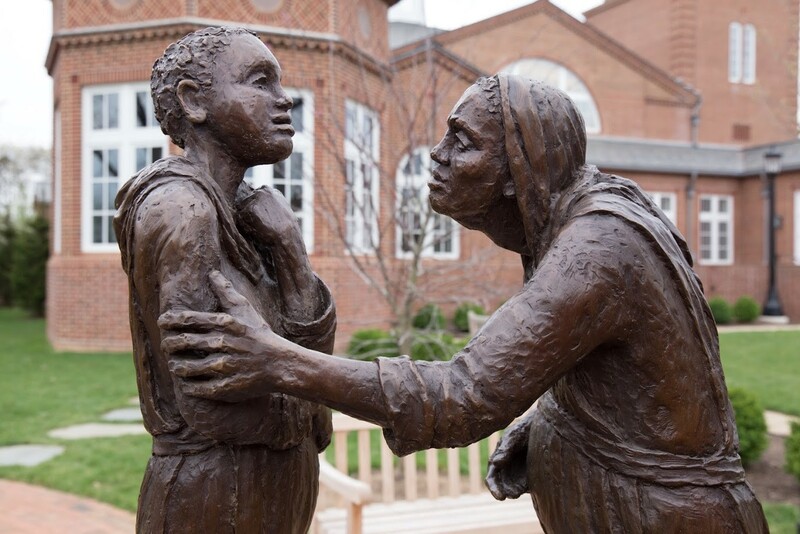 Parker’s sculpture portrays the moment in Luke’s gospel when Mary visits Elizabeth (Luke 1:39-45). Luke writes that “Mary arose and went with haste into the hill country, to a town in Judah, and she entered the house of Zechariah and Elizabeth” (1:39, 40). As I walked around Parker’s figures, however, it occurred to me that their roles are reversed. Instead of Mary looking for Elizabeth, it is Elizabeth who seems to be looking for support. Elizabeth’s face is filled with questions, searching out the promise that Mary carries. Luke’s dual annunciation accounts, which preface the visitation, point his readers to the creative power of the word of God. In these accounts, God’s words are delivered by the angel Gabriel, and they are received by Zechariah and Mary. These words proclaim the coming of two individuals, John and Jesus, and the establishment of the eternal Davidic kingdom. Readers often puzzle over Zechariah’s punishment. Why should he be mute because he disbelieves God’s words, while Gabriel patiently answers Mary’s doubts? It is an open question as to whether Zechariah is punished for his disbelief. Mary receives neither reward nor punishment for her response to Gabriel, and so one wonders if divine cursing and blessing is really what Luke is getting at. Instead, a more fruitful interpretation of these two annunciation narratives may focus on the way that Gabriel’s words to Mary surpass his words to Zechariah. Gabriel’s promise to Zechariah and Elizabeth closely mirrors promises that were given to Manoah and his wife (Judges 13) and Abraham and Sarah (Genesis 18). In these Old Testament antecedents, barrenness is not a barrier to the gift of a child, and God’s promise is fulfilled in history. Gabriel’s promise to Mary, however, differs from the promise to Zechariah in several respects. Mary, unlike Elizabeth, is a virgin and not barren. Mary is young and Elizabeth is old. And the promise to Mary is not merely that she will have a son, but that he will reign on David’s throne forever – a promise that points back to 2 Samuel 7 and that has yet to be fulfilled. Zechariah, a priest honored with the opportunity to offer incense in the holy place, disbelieves Gabriel’s words, and Mary, a young girl from Galilee, accepts Gabriel’s words. Parker renders Elizabeth’s gaze with a quizzical wonder that seems appropriate for someone who cannot fathom the new reality before her. The questions that fill her mind must be great and many, as numerous as the stars that God showed Abraham. Pregnancy is typically a time for wondering, questioning and anticipating, but these visions must stretch Elizabeth beyond her imagination. And so she holds Mary. I love the way that Parker renders Elizabeth’s grip. It is gentle and tender, just as one would expect from a cousin, but it is also firm and solid. Her thick hand grasps onto Mary’s arm as if it is the one thing that will anchor her in this new world. Elizabeth’s whole body leans into Mary’s slim figure for support and stability. and the rich he has sent away empty (Luke 1:51-53). The physical location of Mary as Prophet is poignant and moving. Mary and Elizabeth quietly stand beside Immanuel Chapel, the old chapel that lies beautiful and ruined. A path runs from the sculpture to the new chapel, which sits a mere stone’s throw away. Encountering Mary and Elizabeth between the two chapels, the connections are tantalizing. The dual chapels resonate with the dual wombs of Mary and Elizabeth as spaces where God is with us. They are spaces where the word of the Lord is proclaimed and received. They are spaces where the creative power of God breaks into our lives, and, like Elizabeth, we may find ourselves in awe of what God has done. They are spaces pregnant with the body and blood of Christ that, in the sacrament of the Eucharist, we are graciously offered in the hope that one day all of the words that the Lord has spoken will be fulfilled. 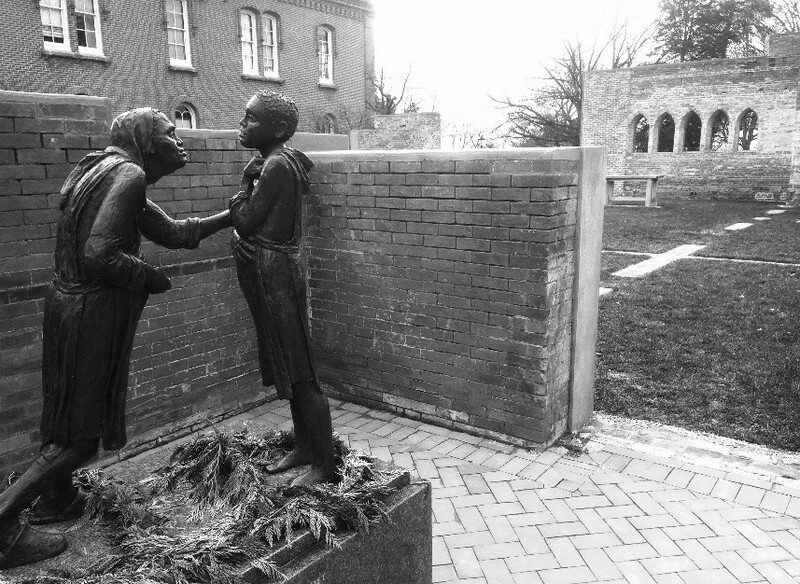 Mary as Prophet (2015) is a bronze sculpture standing 48” high and depicting the Visitation. 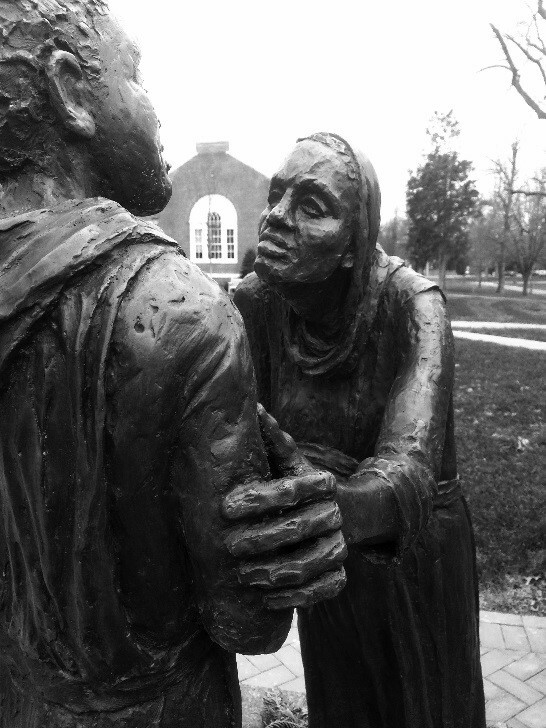 It was commissioned by Virginia Theological Seminary, Alexandria, VA, USA. The sculpture was blessed by the Archbishop of Canterbury as part of the services consecrating the new seminary chapel. Mary as Prophet is positioned outside the walls of the historic chapel and within sight of the new chapel. Margaret Adams Parker (BA, Wellesley College; MFA, American University) has taught as an adjunct instructor at Virginia Theological Seminary since 1991. Peggy is a printmaker and sculptor with an extensive record of exhibitions, commissions, and publications. Her woodcuts illustrate Who are you, my daughter? Reading Ruth through Image and Text (WJK); are owned by the Library of Congress; have been published by the UNHCR, Christian Century, ARTS, and Tikkun, and reproduced by the Church of England and the Anglican Consultative Council. She has created images for several religious presses and Amnesty International. She received fellowships from the Virginia Commission for the Arts, the Association for Religion and Intellectual Life, and Calvin College and served as Artist-in-Residence at Wesley Seminary’s Center for Art and Religion in Washington, DC. James M. Watkins is an artist and upper school humanities and theology teacher at Veritas School. He received a PhD in theology from the University of St Andrews, and he is the author of the book Creativity as Sacrifice: Toward a Theological Model for Creativity in the Arts (Fortress Press, 2015). He lives in Richmond, VA with his lovely wife, four growing boys, and six noisy chickens.